Arothron nigropunctatus (Bloch & Schneider 1801), the Blackspotted Puffer. Some of the Moray eels, Butterflies, Hawkfish, Tangs, Triggerfish, Dwarf Angelfish, any of the bigger Blennies, a Harlequin Tuskfish, Wrasses, Filefish and one of the tougher Clownfish. Hi Crew, your advice has been helpful in managing my tanks and your website is so full of great info! But I haven't seen this question, thus the question. I am adopting 2 puffers. One is a porcupine puffer and the other is a dogface puffer. They will go with my snowflake and zebra eels. They are at least 6-7 years old and the previous owner had them 6 years. They are both about 5 inches long. Do you thing they will grow much more at their age? Just planning for future tank size if needed because right now they are going into a 180 gallon. I also have a 300 gallon so I'm fine upgrading tanks if I need to, just trying to plan it out a bit. Thanks! Hey guys. Long time reader, first time questioner here. About a week ago I introduced a 18" Dragon Eel and a 6" Dogface puffer to a 150 gallon tank without any other fish. <Be sure to use a powerful skimmer and possibly mechanical filtration for these messy carnivores. Fascinating but messy!> The next day I added a Volitans Lionfish to the tank that was slightly smaller than the puffer. puffer can be like a battering ram with a beak and 6" is big enough to be ornery and set in its ways...time will tell how this particular one will act. I have met several people with nasty scars from puffers and triggers. The lionfish on the other hand was very timid and wouldn't eat for 5 days. Last night we found the lionfish with bites taken out of his belly, and unfortunately he has passed away. We believe it was the puffer that did this, not the eel. I have read on your site, unfortunately after the fact, that puffers can nip at lionfish fins. Is this amount of aggression towards the lionfish normal, though? Any insight would be greatly appreciated. Thanks, Evan. <Sad to hear of your loss but with experience comes knowledge. My advice is to study up as much as you can, especially with large possibly volatile predators, before adding a new fish. WWM has some pretty in-depth info on triggers and puffers. Another key thing with these guys is order of introduction: least to most "mean". The lionfish should have gone in first, then the eel, then the puffer imo. The idea is to let the more timid or vulnerable guys to establish themselves first and also when the new ones come along they have not already entrenched themselves in a tank they consider their turf to defend. Thank you for such a quick detailed response...I greatly appreciate it. 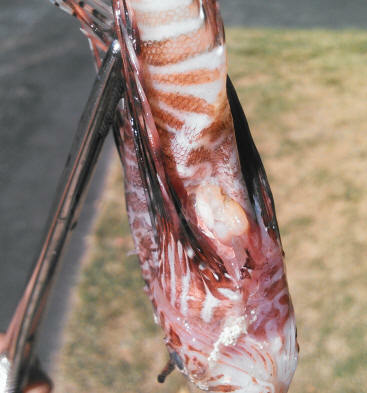 <Glad to help> I have enclosed a photo of the lionfish (post-mortem). As stated before, both fish eat like pigs. Is it possible to overfeed the eel like the puffer? <That is an issue. Eels should eat every 3 days or so. Target fed with a feeder stick, ideally chopped up into strips. Luckily puffers will go to town on the same kinds of food so that's a bit of convenience...I have always supplied most of the food for those who eat large, meaty stuff via simply dicing various raw frozen seafood (shrimp, squid, clam) and supplement it with Selcon every so often...better food for far less money). But target feed eels if necessary and only 2-3 times a week.> Dragon Eel has a few "regular" spots it hangs out in. Some it is completely covered, and others only partially. He comes out as if to "say hello" whenever you approach the tank. This is the main reason bought this specimen, for his personality. He does not hide all day and move only at night...he acts the same in my tank as he did at the LFS. The puffer will come greet you also, and rests in a few regular spots through out the day as well as free swimming in the powerheads. Should I for the safety of the Dragon Eel and return the Dogface Puffer? Personally I would return the puffer and go for a trigger (preferably one of the calmer more easy-going but tough species, see http://www.wetwebmedia.com/marine/fishes/triggers/rhinecanthus/index.htm . Then monitor as I've mentioned. Another alternative would be to put the dog face (and any other aggressors) into a floated "time-out" container inside the tank where they can see and smell each other but not get into contact. About two weeks ago I order some fish for my 60 cube reef tank online. When the order came in, it also contained a guinea fowl puffer which I did not order. When I called about it, they said it was a mistake, and that I could just keep it. So I put it in my 155 fowlr, which also has a midnight puffer (black dog face). They are about the same size, but the last couple days, the Guinea Fowl has been chasing, biting and holding onto the midnight puffer. Is this something that happens in beginning, and once they establish hierarchy, goes away? Or should I go ahead and throw the midnight on craigslist? I do not see any visible wounds from the "bite" but not sure long term if there can be ill effect. Is there any reason to think that a Stars and Stripes puffer will not get along with a Porcupine Puffer in an uncrowded 180 gallon FOWLR aquarium? The Stars and Stripes is about 5 inches long and has been in the tank for roughly one year. The Porcupine is a bit bigger (6 inches) and would be the new addition, along with a Raccoon Butterfly. Lastly, I keep my specific gravity at 1.018 to 1.019. The fish seem to do well at that level. Any issues with a lower specific gravity for the Porcupine puffer or the Raccoon butterfly? We introduced a 14 inch Snowflake Eel into a 100 Gallon tank with our Dogface Puffer last night. This is a FOWLR, 0 Ammo, 0 Nitri, 5 Nitrate. The Puffer has existed alone for about 2 years. I moved rocks, etc when adding the Snowflake and the lights are off. These are the only two animals in the tank. It appears there is some aggression, or struggle for dominance. Everything I see on your site shows compatibility should be fine. The eel has, on a couple of occasions, approached the puffer with his mouth open and drawn back at the last second. It appears he goes after him for food and then realizes that he is too big. The Dogface is about 4-5 inches. In turn, the puffer has snapped at him a few times. Other times they appear to cross each others paths just fine. Is this likely an initial acclamation issue; or, do you think we have an individual showing above average aggression? My hope is that you will tell me they are "learning" to coexist. if I need to remove the animal, I certainly will. Thanks, as always, for your advice! Hi there Crew, I was thinking of getting a stars and stripes puffer. I know they are a messy fish and require a superior skimmer and great water conditions. I also know they are more peaceful puffers compared to others. My question is I have a large rose bubble anemone, with a pair of tomato clowns hosting it. Do you think the Anemone is safe or is it future puffer food? but you also warned me about my stars and stripes puffer maybe intimidating the emperor, well I have just noticed one of my lyretail Anthias has a chunk taken out of it's back (the Anthias seems to be doing fine he's eating and swimming around) and the only fish capable of doing that would be my puffer, is this typical puffer behaviour? I have a few small fish in the tank that i don't want the puffer making a meal off, and even though he is one of my oldest and favourite fish I don't want him killing all my fish, is there a possibility that this could happen and if so do you think I should hand the puffer back to my LFS? Also do u have a section on your site on how to set up a quarantine tank? I have a spare 2 foot tank that I want to turn into a quarantine tank. Again sorry for all the questions but as always your great help is also greatly appreciated. Unfortunately I don't have another tank and i wouldn't have the room for another good sized tank as much as I would love one, the tank I have now is 5x2x2.5 it's 187 gallons (US) which, if the puffer reaches it's potential 50cm, will eventually become too small for him, I'm reluctant to hand him to my LFS as he is a good size and I think most the time they see £ signs and will sell a fish to anyone regardless of the size of their tank or their experience keeping certain fish, although I don't know many people with a large predator tank either so It looks like I have a job on my hand to find him a suitable home but hopefully I will, so as always it's been a pleasure Bob and thanks again for your help. I have been searching your site of late but have not been able to identify exactly what is going on with my Dogface Puffer. 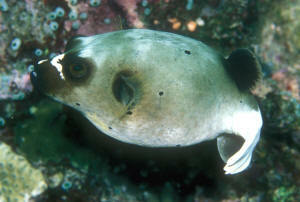 The puffer is about 3.5 inches long and resides in a 180 gallon FOWLR aquarium. His tankmates are a Maculosus Angel, an Annularis Angel, a Lunare Wrasse, a Maroon Clown, a Flame Hawkfish, and a Coral Beauty. He is fat, active at feeding time and at night, eats just about everything I put in the tank, and seems to be pretty healthy with the exception of his tail. My puffer looks like someone chewed off his tailfin. From what I can tell he does not have fin rot, as his entire tailfin is gone. There appears to be rather extensive tissue damage (ragged, torn tissue), although I have never seen another fish biting or harassing him. Does this sound like a bacterial infection/Finrot, or is it more likely the result of aggressive behavior from a tankmate? Should I be worried about a secondary infection from the tissue damage? The puffer's behavior seems very normal, but his tail really looks horrible. Is there anything I should be doing other than regular water changes and providing a proper diet? I'm not to sure if the lion was dead or not before he ate him in half but in pretty worried for the safety of the other lions & all my other fish, they are in a 187 gallon tank which I just upgraded to a few weeks ago so their is no problem with space but this has got me worried, I don't want to lose any more fish so could anyone tell me what I should do, I've kept marines for 5 years and have never had this happen with any fish, any help would be great. I have a beautiful, 6 inch dog face puffer fish in a 400 litre plus tank with two bird nose wrasses (one male, one female) and a spots and stripes puffer. They have all shared the tank from new for approximately six months without any real issues. For reasons above my expertise, I encountered what I think was a PH crash that contributed to a flare up of Ich. I have been treating the whole tank using the hypo salinity method, raising the temperature to eighty-two degrees. I have gradually reduced the temperature back to the optimum levels now and I am happy to report all fish have responded well. A couple of days ago I noticed that the dog face puffer had started to display aggressive behaviour towards the other fish and also toward me when approaching the tank. I have had to segregate him from the others to reduce the risk of injury to all inhabitants. I have covered his section of the tank to allow him to hopefully settle down. Can anyone offer me some clues as to what may be going on as I am not a fish psychologist and cannot figure out for the life of me why his temperament should have changed so dramatically. Salinity is currently 0.011, Nitrite 0, Nitrate 10, Ammonia 0, PH 8.1, Temperature 79 degrees. Thank you very much for your quick response. I have now (today) started the slow arduous process of increasing the salinity back to optimum parameters, but the fish in the first instance seemed to have responded extremely well, no spots on body for near on two weeks (not to say they will not reappear as I have read several times to maintain low salinity for 3 to 4 weeks) and all seem perkier. However by the time I have raised the salt back it will have been approximately that length of time so here's putting the theory to the test. I did however combine this with two fresh water dipping sessions in Cuprazin to try and get rid of the little nasties on the skin but since this contains copper I did this carefully and with a great deal of reluctancy, hence only two dips. With reference to the tank ( not to shoot the shops (deliberately plural)), this was the size they recommended I was also going to have a porcupine at the time but decided against it due to their temperament (sounds like a good job I did). I have read many of your blogs in my pursuit for knowledge and yesterday read some correspondence referring to a book that you have written. Could you please provide me with the title so I may make a purchase. I have just two questions remaining at this point. Firstly even though I have read many reports regarding the effectiveness of hypo salinity why do you consider this to be of no use? Secondly but more importantly what size of aquarium would you recommend for my little ones as I feel reluctant (the spots and stripes is only 3" long at the moment, and I am being generous at that) to let any of them go and do not really fancy multiple aquariums (my living room is just not big enough I'm afraid). I have managed to locate your book, it was really easy to find too. Will be purchasing one today. Can you recommend the best reference options available to date for diagnosing disease ( in particular puffer) or is there a section dedicated to this in your book as this is not detailed in it's description? Thank you for your assistance thus far. I will also purchase this item too. Mr. dog face seems to be more settled today. I am beginning to think that his tantrums predominantly seem to relate to feeding time as he normally interacts with all his tank mates very well. Since he has been separated from the others he no longer needs to compete for food, hence an upturn in his temperament is being observed. I suppose time and further observations will tell. This little chap has always been happy to see me and eats from my fingers on a daily basis. He also seems to enjoys a tickle or two when I am cleaning the tank which includes sitting in my hand, aah! I really hope he returns to his former self soon as I miss the interaction. I will be looking for a bigger QT tank than I currently have as a more permanent back up in case he starts to behave aggressively again when placed back into his usual quarters. It would be a shame to permanently isolate him though. Any further comments you have will be greatly appreciated. Thought you might like an update on my dog face puffer. He has now been returned to his tank mates and the salinity is being progressively increased. I am pleased to say that his tantrums ( probably not tantrums) now seem to have subsided and he is feeding from my hand again. He looks a lot happier now. I have been feeding all the fish with a multi vitamin and happy to report that to date no signs of Ich can be detected on any fish. I would like to thank you for all your support during this stressful time. I would also like to ask if you could recommend a tropical fish book for my daughters boyfriend as he has also acquired the fish bug and has just purchased a 3" tank of his own. I am not too bothered about the price as quality of information is of more important. I would like to give this as an Xmas gift. I recently added a Guineafowl Puffer to my tank. He's been eating well and hunting for things to eat since I put him in. I'm not worried about his health but I do have a question. Today, I noticed he was pooping out some Chaetomorpha Algae. Is this normal? I've never had any fishes eat it in bunches. It seems like he ate quite a lot as he was going at it for some time. I've been feeding him; Krill, Clams, Muscles, Silversides, and he's ate some Coral frags that I had in the tank. Thanks for the help! <The puffer and trigger might eat a Microdesmid, Molly, and the Clowns. Hi there everyone, Its Jim again. I was up at my lfs yesterday. They had a Stars and stripe puffer there. He is about 1.5". I know what kind of eaters these guys are, and how fast they grow. I have a 180, and still currently looking for a 250 or bigger. This is probably a really dumb question. I was thinking of putting him in my 180, but the problem is I have snails, shrimp, and crabs. Do you think if he got put in there being as small as he is he will not kill my Invertebrates? Is there any record of a puffer not eating Invertebrates? I Have 3 Heni Butterflies in a 400 gallon tank nipping the fins off of a Huge "floating Head" Stars and stripes puffer. I think they may be cleaning him to death. Have you heard of this before? I have treated for Flat worms and Bacteria and the fish still pick??? I have the 2 above named fish in a FOWLR. I`ve done some research and was thinking maybe a few mushrooms to brighten up the rock. Also how would a large Tiger Cowry or Tuxedo Urchin fare ? Any other suggestions appreciated ? I have a Dogface Puffer in a FOWLR and this week was giver <given> a cleaner wrasse. Yes he`s very annoying. Been reading the solutions on your pages. Struggling to catch wrasse and don't want to lose puffer. Might the behaviour quieten <quiet> down with time ? The wrasse eats greedily out of the water column so will he start to leave the puffer alone or must he be removed ? I have a reef tank with 3 Tangs in ....Would the wrasse be better in there if I can catch him. I already have cleaner shrimp in that one...Would that be a problem ? <Gary, based on your information, the Cleaner Wrasse is likely trying to "clean" the puffer and will cause no harm. Although rarely offered in the trade, you very well could have a False Cleaner Wrasse (Aspidontus taeniatus) which mimics the Cleaner Wrasse but instead of servicing an infected fish, it actually removes small hunks of flesh from the fish. If so, I would remove this fish. Yes I am aware of the mimic (Blenny ?) but this is the wrasse. He is trying to clean puffer but is really stressing him. Going a really dark grey colour at times. Sorry a bit vague earlier but Bob Fenner wrote in your puffer pages that the wrasse and puffer are not compatible as the puffer`s skin is quite tender and the constant attention of the wrasse is too much so one or other should be removed. I meant I didn't want to rehome puffer and can't catch the wrasse at present to rehome him. I have seen film of them together in the wild but was really just wondering if the wrasse would not clean quite so much if well fed anyway. Maybe when settled things would improve. <Yes, it is. I originally answered this query based on Cleaner Wrasse behavior. Puffers are definitely not my area of expertise and I will ask Bob to comment here on your above statement. Would you please look at the query in the draft folder and comment. I answered what I could but hoping you can comment on the gent's referral to something you wrote re puffer/Cleaner Wrasse compatibility. Oops, forgot to mention, I did not send the query out. Yes I have decided I want to remove wrasse and return him to LFS. Any tips on catching him? <Hee, hee. Definitely a net in each hand, try to corner/trap. Do read here as well. I am the worst fish catcher in history. Read the fish catching pages. Was thinking to move my live rock and leave about a quarter of the tank free ...move the wrasse to that end with food then block it off. Just read about the fish trap made from a soda bottle. Which method do you think would be best for this fish. If using the trap , would I just put the normal frozen food floating in bottle. Thanks James....Sounds best route to me too. Trap was set at 12 o clock and fish was residing in LFS by 2. Used a slightly smaller bottle than suggested as wrasse was a lot smaller than other fish and it worked a treat. The fact he was so nosey helped too. Thanks again and thanks to EricR for the written article. Gary and Percy the happy Puffer. I have read the articles on Puffers and was still not clear on this. Would a Golden Puffer get along with a Dalmatian Puffer in a 250 gallon tank. I already have the Golden Puffer, and he is very passive towards other fish, however he is the only puffer. I may be mistaken but I think they are both Arothron nigropunctatus. Your clarification here is greatly appreciated. In an article on WWM by John Champlin it appears he indicates this passive family can be housed with other puffer species, but can it be housed if the Golden and Dalmatian are the same family? Thank you for your continued dedication to the hobbyist. goldbar wrasse(5") and a yellow tang who is 6"
in a 150 gallon tank(US) with protein skimming. The yellow tang threatens the puffer when he/she(the puffer) goes near the tang's territory with his acanthus. Also the puffer won't eat anything. I know he/she probably won't eat anything in the next 24 hours when you acclimate them but also seems to have slightly overgrown teeth. The reason I assume this is because he/she goes to the side of the tank and seems to be "biting" the glass or his/her reflection. The others don't bother him/her. Also when the yellow tang threatens him/her, his/her tail goes to the side of the body, like a submissive gesture I suppose. <... this fish really needs to be put elsewhere... At least for now. See WWM re the family, en toto. approximately 160 lbs. of live rock, a protein skimmer and lots of flow. My livestock is a Yellow Tang (6"), Harlequin Tuskfish (4.5"), Niger trigger (4" including tail lobes) and a goldbar wrasse (5"). The tank has been setup for a year now. My first question is rather or not these two fish are compatible with each other? Secondly, shouldn't they (especially the puffer for his 'teeth') be eating crustaceans? I have been feeding both of these fish for the past month and they will only eat pellets, frozen muscles (cubes), and Krill. I have tried feeding them crab legs from the grocery store, whole muscles, and small live inverts, but they want nothing to do with any of that. I have read that it is important for puffer fish to eat hard foods to keep their teeth from overgrowing; how can I coax him (I have also tried adding garlic to these foods)? Lastly, I was reading a section about puffer fish bites. Is it typical for them to be aggressive toward their owners? they swim to the water's surface and let me 'pet' them (which makes me want them that much more)'¦is this abnormal of these fish? but with the commercial skimmer which is huge it makes a big difference. I test my water every day. <? Diligent indeed! I only test every two weeks!> My tank has been setup for 3 yrs. for over 2 years, currently he's in my 55 gallon tank which I know is WAY too small for him but definitely a step up from where he was, I'm just waiting for the 215 gallon tank to finish cycling and he'll be moving in there. The 215 gallon tank measures 72.5x24x30 has dual 600 gph overflows for a total of 1200 gph, which flows into a 61x18x18 tall sump that contains a AquaC EV240 protein skimmer, LR and LS, and is returned to the tank via a Dolphin 3200/2700 pump with a valve to tame it's output, also next to the sump is a refugium that is fed by the Dolphin pump and flows back into the sump. In the tank there is 150+ lbs of LR and almost an equal amount of live sand, as well as two Koralia Magnum 8 powerheads for supplemental circulation. Now moving onto the question, the Stars and Stripes puffer is very happy and even wags his tail and almost smiles when I bring food in front of the tank, he has a great personality and doesn't seem to bother the other fish, I've fell in love with the Map Puffer and really want to get one, would they be okay together? If so, should I try and find a larger one so that the size difference isn't too great between them? There will also be a few other fish such as a small school of Green Chromis, a pair of Black Clownfish, a lawnmower blenny, Blue Hippo Tang and possibly a few others, I'm also going to try and have snails as long as they don't get eaten, but if they do it'll be a nice little snack! I know that the Bio load is going to be extreme with 2 puffers if it's possible so do you think that the filtration can handle the load? Along with regular maintenance of course! I apologize for my long winded email, I just wanted to include as much information as possible so that you guys could get a somewhat clear picture! Thanks again for all of your contributions to the hobby! First off, thank you so much for this site! I use it all of the time and it has been extremely helpful! I just started off my 75 gallon tank with 80 pounds of live rock about 5 months ago. I currently have 2 Large Percula Clownfish, a Dog Face Puffer, a small African Dwarf Lionfish and a Huge Blue Starfish. They all get along just fine with each other! However, I've been having a couple issues. My puffer is eating all of my snails and crabs, which I knew would happen. Anyways, my tank is starting to get that nasty look to it due to the algae growth...which is most likely due to the diminishing population of my snails and crabs. Also, my puffer has been nipping at the ends of my starfish...which I read he wouldn't do so. Is there a possible cleaning crew that I can place in my tank, that won't be bothered by my puffer? Are there any types of snails, conchs, crabs, urchins, clams or starfish out there that will work out? I really do love this guy, but he seems to be eating everything, which is polluting my tank! Also, what kind of other fish would make excellent tank mates with this puffer? I want to keep him, but I'm also trying to expand my tank life. Greetings and Happy Holidays to the Crew! I have a 10 inch long Stars and Stripes Pufferfish who first of all does not interpret a white flag as a sign of surrender. I tried to clean the front of my tank with a simple wet washcloth and his spikes began to show and his size increased. Simple word of warning to Puffer owners. But I am in need of removing very unsightly (and still a little meaty) clam shells from my aquarium. The rest of my fish are primarily herbivorous and have shown no signs of helping me out. I've been shopping and have been unable to find suitable gloves to protect the little bit of my hand that goes in with the net and when I try to put seaweed clips in my aquarium. The sort that are thin plastic are easily to find but I need something that will GREATLY reduce the chance of a rather bloody looking aquarium. They come in different lengths and are very useful in getting things out of the tank easily. Also a fan worm question, will my puffer eat the largest of fan worms? Half an inch in diameter or more? After reading the bit of information there it spurred a question into my head. Supposing I do get bitten doing whatever, how do I best coax my puffer to let go of whatever he bites? I was thinking with a deep enough sand base and a elaborate Rock aquascape, that would provide the Jawfish with enough cover to build a comfortable home while not pestering the Puffer? Bob, your book is great! i read it cover to cover over a weekend with my highlighter! Thanks so much!